I love Japanese food and Maki more particularly. 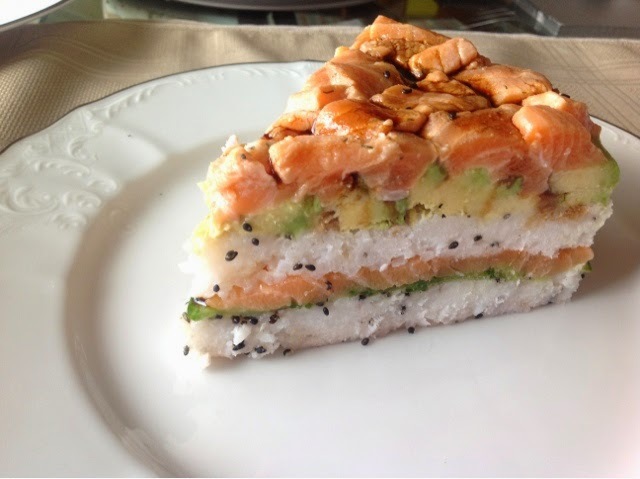 But what got me started on this sushi cake is this picture above your eyes. I got inspired by this and I made my own. 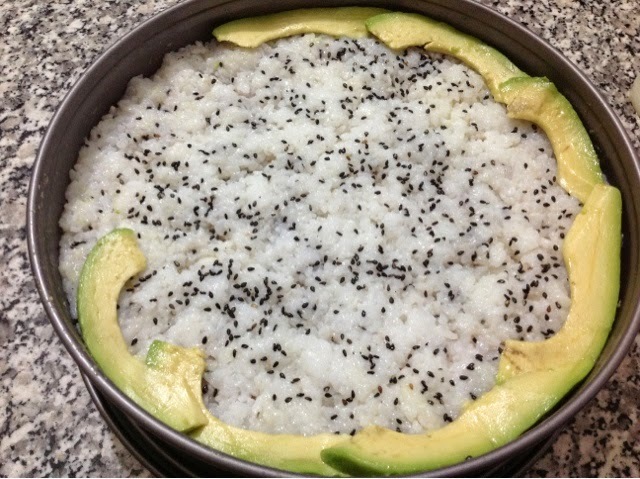 But I’ve got to tell you that the rice won’t look like in this picture at all! I guess they were faking it a bit for the aesthetic of the picture. 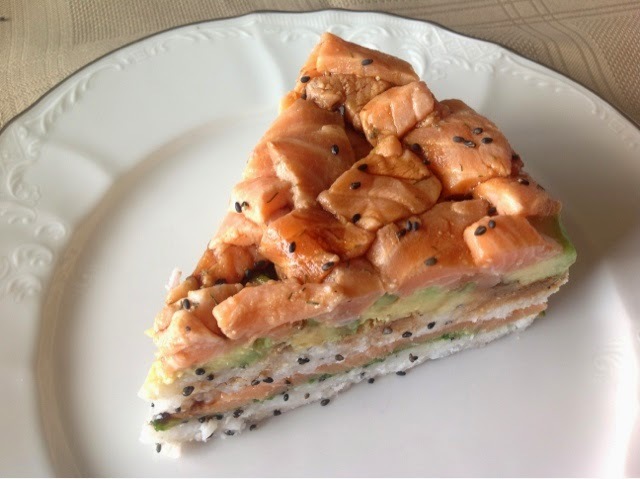 I used 1 kg of fresh salmon for two layers (around 30$), the middle layer is just salmon with a bit of lemon juice for a nice smell while the top layer is salmon mixed with lemon juice, just a bit of dried dill or aneth, black sesame, and red chili soy sauce. 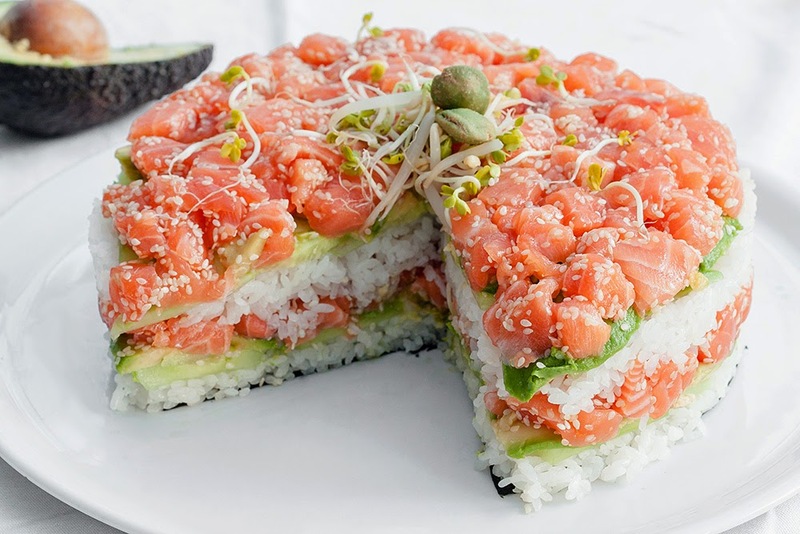 If you don’t have the budget for a double layer salmon cake, I would suggest you start with a thicker layer of rice, then cucumber, then avocado, and top it with a salmon tartare—In this case, you would just need 500g of salmon and 150g of rice for a 26cm diameter pie mould. 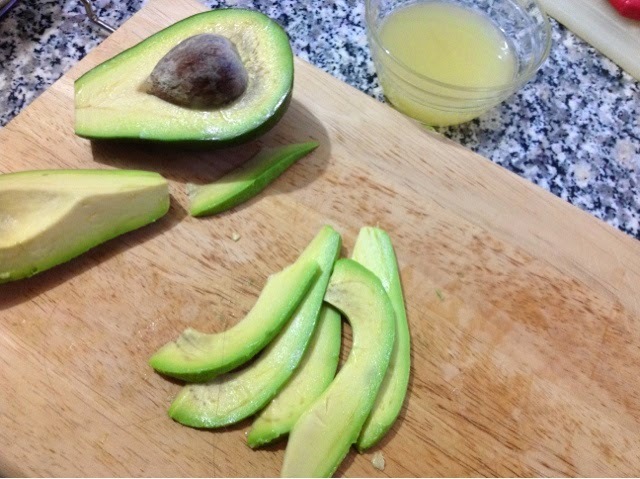 Add the vinegar, sugar, and salt in a saucepan and heat until the sugar dissolves in it. You can even keep it a little while longer; when the vinegar forms bubbles, the sugar is caramelized and the seasoning has thickened. 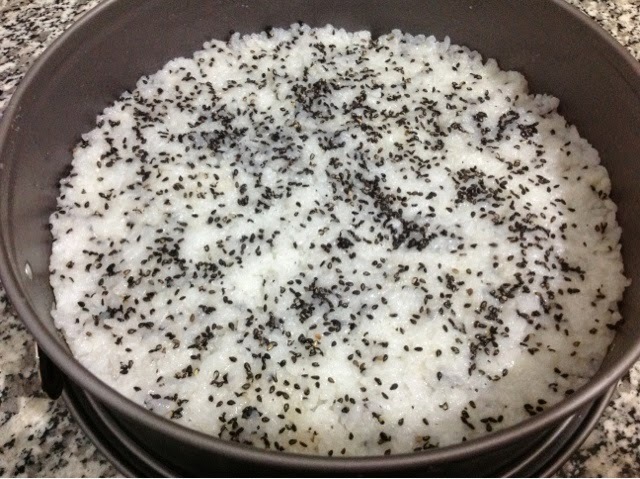 Pour it over the rice with the black sesame and mix gently. 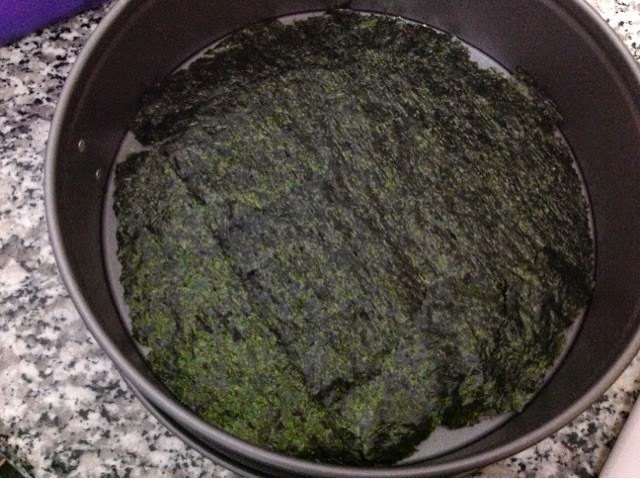 Place your Nori sheet as a base to your sushi cake. If the square is smaller than the mould area, overlay the Nori and cut the corner that extend beyond the mould circumference. Line the bottom of the mould with the rice. 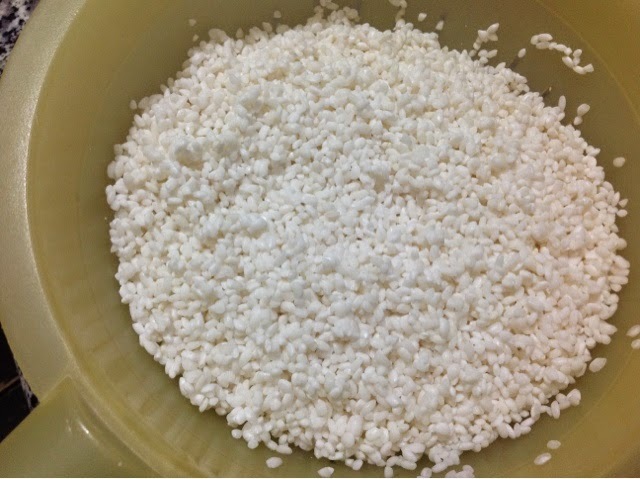 Wet your hands, so the rice will not stick on them, and push down firmly. Slice the cucumbers with the tool. Choose the best ones and start by decorating the borders. 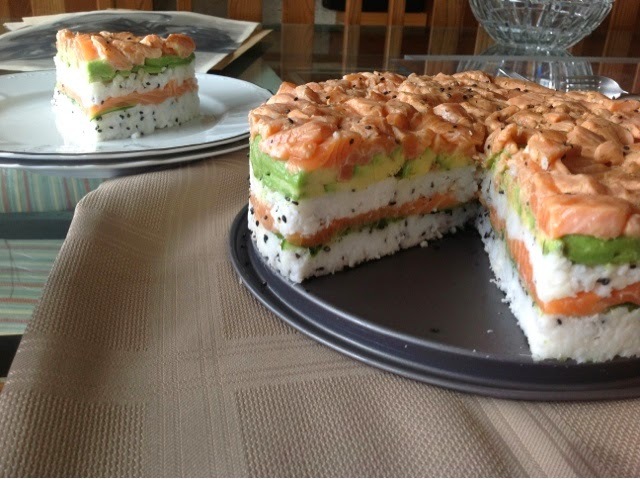 We pay more attention to the borders because this is what will show when we will unmold the sushi cake. 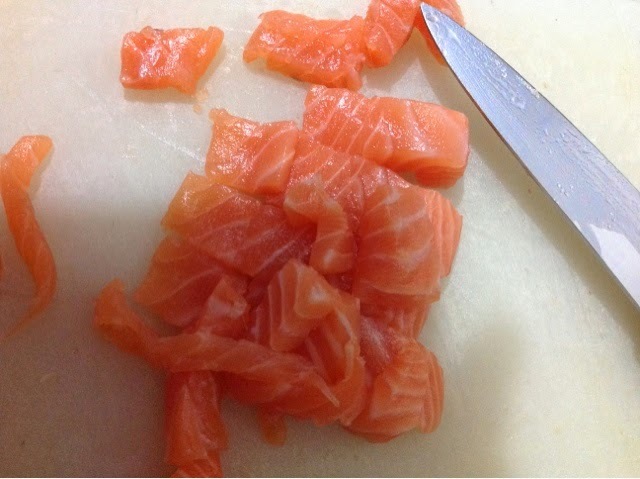 Keep the beautiful pieces of salmon for the top layer. Take the rest and cut it long; garnish the borders of the mould and once done, fill in the whole layer. We add another layer of rice, and we proceed in the same way as we did formerly. If you feel the need to add some more black sesame, do so. 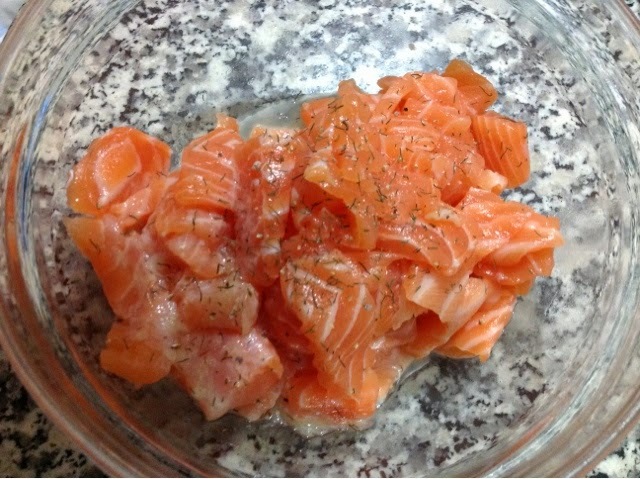 Cut the beautiful pieces of salmon into identical cubes, mix with 2 tbsp of lemon juice, soy sauce, ground white pepper, black sesame, and dried dill, (Aneth in French). Top it over the avocadoes like for a tartare. 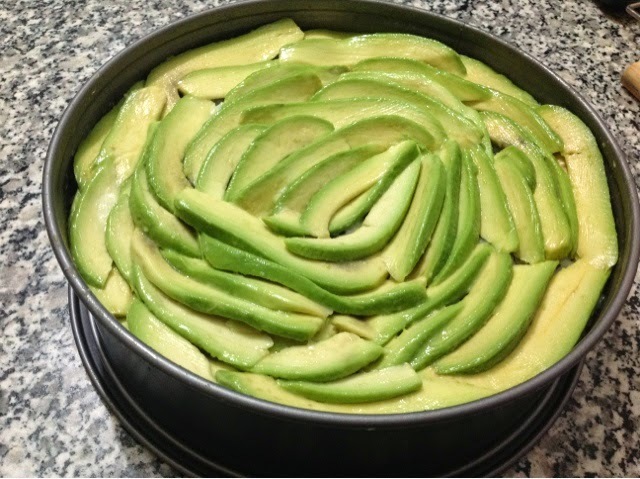 As for the decoration, you can roll a long and thin piece of salmon to make a rose and use 3 small and thin slices of avocado to do the leaves. The outcome? I feel so proud, see below! Omg:O Next meeting you're cooking for us!